Today I launched a new blog on projectmanagement.com. As a leader of the PMI Agile Community of Practice, I had the opportunity to be a Trailblazer in PMI’s new online community and set up a blog. 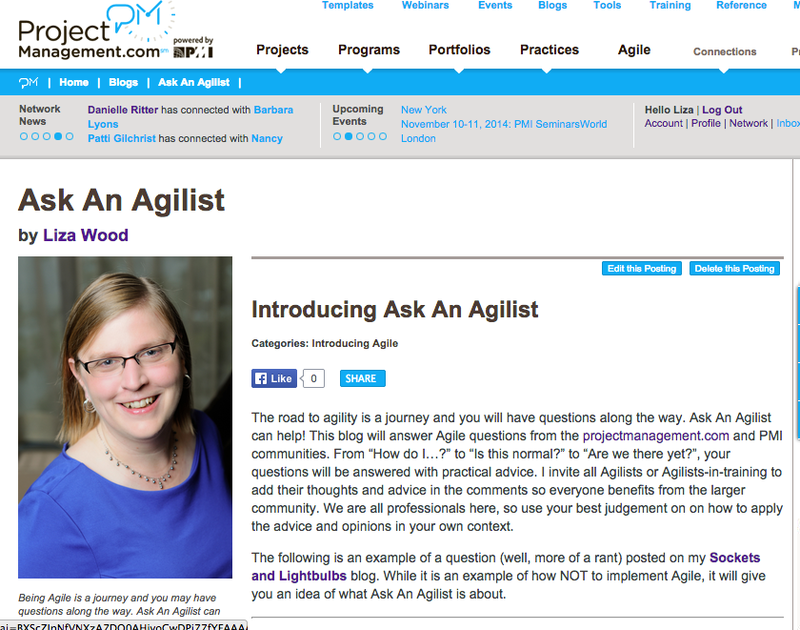 Ask An Agilist will be focused on answering questions about Agile development and leadership from the projectmanagement.com and PMI communities. If you are a member of the PMI or projectmanagement.com, check out the blog, share your advice in the comments, or ask your question by sending me a message through my profile page. Don’t worry, this blog will still have unique content, discussing bright ideas on Agile leadership agnostic of profession or industry. Ask An Agilist will be dedicated to discussing topics from and within the project management community. Between both blogs, there will be plenty of inspiration!